The Russian conglomerate is looking to sell helicopters, commercial planes, trucks, defence systems and high-tech products to Thailand. In return, it will arrange for the sale of Thai commodities in Russia. Russian state-run conglomerate Rostec is working on a “complex deal” that could provide a major boost to Russia-Thailand bilateral trade, The Bangkok Post reported on its website. "We are in the middle of negotiations, and that will be a complex deal," Viktor Kladov, head of the International Cooperation Department at Rostec told the paper. According to the report, Rostec is in talks to provide new markets for Thai commodities such as rubber, rice, food and fishery products. In return, the Russian conglomerate wants Thailand to buy helicopters, commercial aircraft, trucks and defense equipment. Thailand has traditionally relied on the West for its defense requirements, but the country is looking to diversify its purchases. In 2011, the Thai military purchased three Mi-17V-5 helicopters. This was followed up with an agreement to buy two more of these multi-role helicopters for around $40 million in October 2014. 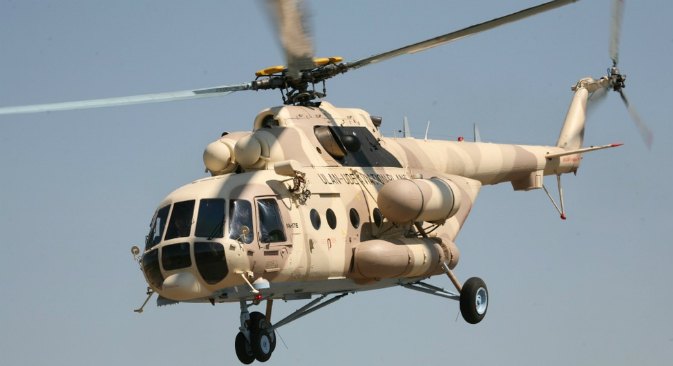 Russian Helicopters, a Rostec group company, has proposed two other helicopter versions for Thailand -- the Mi-8/17 series and Ansat light helicopter, according to the Bangkok Post report. The paper added that Russian Helicopters' sales pitch to Thailand is that their products are as reliable as Western-built helicopters yet half the cost. At last year’s Indo Defence 2014 arms expo in Jakarta, officials from Russia’s export agency Rosoboronexport said they could sell several more of the multi-role helicopters to the Royal Thai Army’s air division. The agency is also keen to supply Thailand with Sukhoi Su 30MKI fighters, which are operated by air forces in India, Malaysia, Vietnam and Indonesia. Although Russia could not sell the fighters to Thailand in 2008, there is a likelihood of Bangkok looking to upgrade its air arsenal this year.